Earlier today, Marvel and Netflix confirmed three new cast members for their highly-anticipated spin-off The Punisher, which we learned earlier this week has already started filming. Today we have even more photos from the set, which confirm that Daredevil star Deborah Ann Woll will reprise her role as Karen Page. The actress was seen conversing with Frank Castle on a park bench in these new photos. The first set photos that emerged this week only showed Jon Bernthal by himself on the New York set as Frank Castle. These new photos from Twitter show Frank and Karen's meeting. There had been rumors that one of the new characters coming aboard for The Punisher spinoff is Microchip, and we learned today that Ebon Moss-Bachrach is playing this character, now dubbed Micro, a former NSA analyst whose secrets may be of great value to Frank Castle and everyone around them. Amber Rose Revah also signed on to play Dinah Madani, a highly-trained sophisticated Homeland Security agent who is vexed by the Punisher, while Ben Barnes plays Billy Russo, Frank's Castle's best friend from his days in the Special Forces, who runs a successful private military corporation called "Anvil." Since The Punisher made his MCU debut in Daredevil Season 2, it isn't terribly surprising to see Frank Castle and Karen Page interacting with one another. 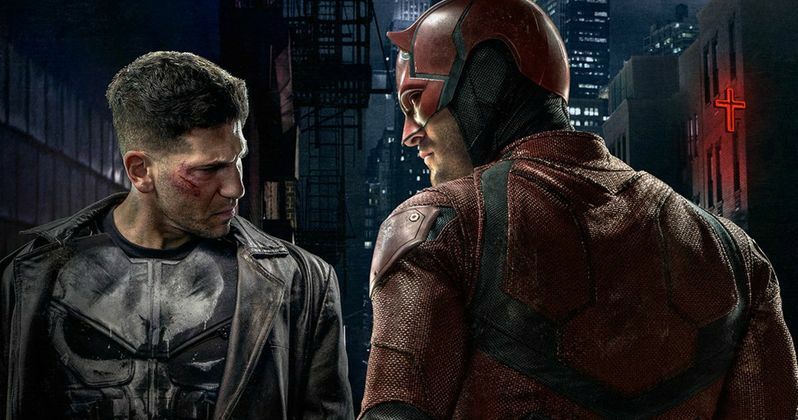 It hasn't been confirmed if any other Daredevil stars such as Charlie Cox or Elden Henson will make any appearances in this spin-off, but this whole MCU TV universe has never had a shortage of crossovers. Rosario Dawson's Night Nurse has appeared in Daredevil, Jessica Jones and the most recent Marvel Netflix show, Luke Cage, which debuted this past weekend, but it remains to be seen if she will surface in Iron Fist, which is slated to debut March 17. Marvel also confirmed a 2017 premiere for The Punisher, although an exact date wasn't given. It's also believed that The Defenders will debut in 2017, but we don't have a premiere date for that series yet either. While production is certainly under way on The Punisher, Marvel hasn't confirmed when The Defenders will start production quite yet. Steve Lightfoot (Hannibal) will write the series' first two episodes in addition to serving as showrunner and Executive Producer. Jim Chory (Marvel's Daredevil, Marvel's Jessica Jones and Marvel's Luke Cage) will also serve as Executive Producer along with Jeph Loeb (Marvel's Daredevil, Marvel's Jessica Jones and Marvel's Luke Cage), Marvel's Head of Television. Marvel's The Punisher is produced by Marvel Television in association with ABC Studios for Netflix. Take a look at the new set photos below featuring Deborah Ann Woll returning as Karen Page.